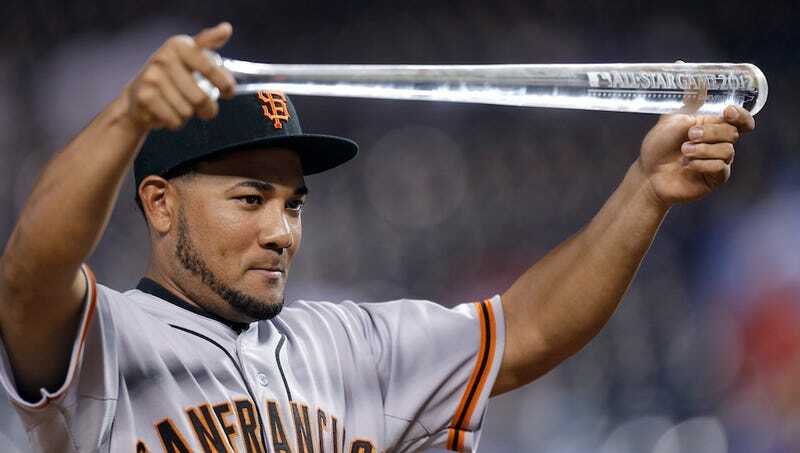 Did Performance-Enhancing Drugs Actually Help Melky Cabrera? Maybe Melky's numbers are nothing but a mirage, anyway. Maybe he really isn't a .346 hitter on a level playing field. Maybe he doesn't have 11 home runs playing home games in a big ballpark, or 60 RBI. Or even 13 stolen bases. Maybe he doesn't have anywhere near those numbers without the extra help. His career turnaround seemed too good to be true. And so it was. Heyman couches everything in "maybes" here, but his point is essentially this: Without testosterone supplements, Melky Cabrera is a below-average player, the doughy fourth outfielder he was in New York. With them—and because of them—he's on the verge of winning a batting title. But a closer examination of Cabrera's numbers suggests an alternate possibility: Performance-enhancing drugs haven't done much at all for his offense. Yes, Melky's hitting .346, a full 62 points better than his career average. But everything else he's doing is in line with his usual performance. He's walking in seven percent of his plate appearances and striking out in 12 percent of them, which are the same figures he's had all his career. He's hitting line drives on 21.8 percent of his batted balls, only a slight uptick from his usual 19.7 percent mark. The 10.7 percent of his fly balls he's hitting for homers is in line with the 10.3 percent of his fly balls he hit for homers on the 2009 Yankees, back when he was supposedly a loser. The only big spike for Cabrera came with his BABIP (batting average on balls in play). His career BABIP is .309, but he hit .332 on balls in play last year and .379 on balls in play this year. Good luck explains some of this, and we can explain even more by looking at Cabrera's underlying numbers. This year's version of Melky is more or less last year's version of Melky, only with a different approach at the plate: more ground balls. And last year's Melky was more or less the same old Melky he had always been, just a little lighter on his feet. That transformation isn't outlandish for a player entering his prime, and it sure as hell isn't indicative of a player receiving a significant chemical boost. But MLB only needs dirty urine; it doesn't have to prove that the drugs worked. Easy enough. So the real challenge ahead awaits Cabrera's agent, Dominic Torres. Torres will have to prove to interested teams that the drugs didn't work. He should consider the numbers above a head start.